Are you searching for a junior bridesmaid dress that coordinates with the rest of your ladies? You're in luck! Discover our great selection of dresses for juniors in a variety of styles and colors. Sophia's Style Boutique offers the fashionable styles you want. It will surely make her look distinctive. Crafted from high quality fabrics, the girls bridesmaids dresses on SophiasStyle.com reflect the latest trends. It will make the ceremony truly special so that you will cherish the memories it will bring. Our great collection of junior bridesmaid dresses are elegant and youthful at the same time. A gorgeous dress for your little princess by Good Girl boutique brand. Girly lace embroidery adds a stylish touch to the Ellie Kids dress for little ladies. Nice pick for flower girls, junior bridesmaids and other festive event, this Ellie Kids dress features eye-catchy color hues. This stylish dress by Good Girl brand is sure to highlight her charm and grace. This stylish Jasmine dress by Petite Adele will give an elegant and gorgeous look. This stylish Valery dress by Petite Adele will give an elegant and gorgeous look. This stylish Joanna dress by Petite Adele will give an elegant and gorgeous look. Beautiful satin dress with double tulle skirt with shimmery accents, sweet 3D embroidery at the waist and a final touch of small pearls. Back zipper entry and ribbon tie to accentuate her pretty frame. Fully lined for extra comfort. Netting beneath the skirt. Tea-length dress. Enjoy this exquisite style in pure white or ivory at your choice that comes with the perfect balance of charm and quality. Elegant Communion dress by My Best Kids exudes purity and grace for young girls. Sequin embroidered dress by Shanil Inc boutique brand. Adorable dress by Kids Dream boutique brand is sure to highlight her special style and charm. Stylish dress by Ellie Kids exudes charm and grace and makes a perfect choice for spring/summer events. Stylish dress by Ellie Kids exudes charm and grace and makes a perfect choice for flower girls, junior bridesmaids and other events. 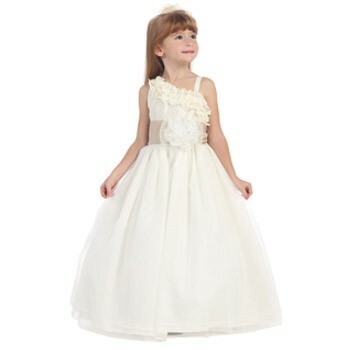 A great choice for fashion girls this KiKi Kids USA gown provides a polished look. Elegant dress by Chic Baby with heavily adorned bodice for flowers girls and junior bridesmaids. Stylish Kids Dream Easter dress will capture attention and impress. Mesh sleeve dress in off-white with pearls on bodice and straps. Dress comes with mesh sash in the back. Knee-length dress features cotton lining and zip fastening. Make her silhouette look polished. It will instantly boost her beauty and charm. Stylish Kids Dream Easter dress will capture attention and impress. Mesh sleeve dress in mint with pearls on bodice and straps. Dress comes with mesh sash in the back. Knee-length dress features cotton lining and zip fastening. Make her silhouette look polished. It will instantly boost her beauty and charm. Stylish Kids Dream Easter dress will capture attention and impress. Mesh sleeve dress in pink with pearls on bodice and straps. Dress comes with mesh sash in the back. Knee-length dress features cotton lining and zip fastening. Make her silhouette look polished. It will instantly boost her beauty and charm. Elegance and style define this Easter dress by Kids Dream. Bring enchanting styles and elegance to your wedding party with our selection of junior bridesmaid dresses, all online at SophiasStyle.com. Featuring a wide array of quality fabrics accented with distinct embellishments and a color palette inspired by the special event that comprises purple, white, coral or others. The junior bridesmaid dresses you find at SophiasStyle are sure to capture the attention of your guests and generate plenty of good opinions and comments. We offer the very essence of beauty and elegance.